Take Advantage of Milgard Fall Savings While You Can!!! L&L Door and Window Retail Will Beat Anyone's Price!!! 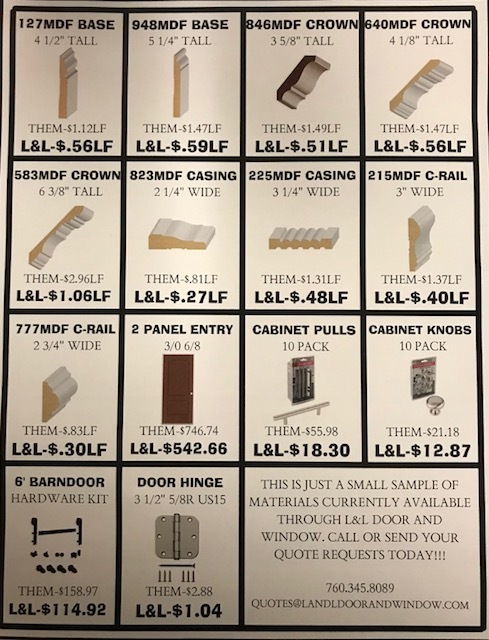 L&L Door and Window Is Less Than Half On Most Materials Available At The "BIG BOX" Stores. See For Yourself Below, Then Call or Email Today!!! Have you heard our latest radio ads? If not, have a listen below as Lance and Leann Morgan explain 4 very exciting ways L & L Door and Window can help you save and get your next project moving forward. A quick explanation of the HERO Program. A brief overview of the IID Rebates. We are a proud Milgard Certified dealer. Find out how you can save more with L & L Door and Window Retail. Check out our brand new L & L Door And Window TV commercial featuring the real brains and muscle behind our operation. We hope you enjoy it! Let us know what you think in the comments below. We love to hear from you! Be sure to check back often for all of the latest news, projects and happenings around L & L Door and Window.